Found an interesting item in the UM Exchange Management Console – Toolbox. Calls per day, broken down into fields like Total, Failed and Audio quality. Each with a Hyperlink, when double clicking you get more info on the calls as below. 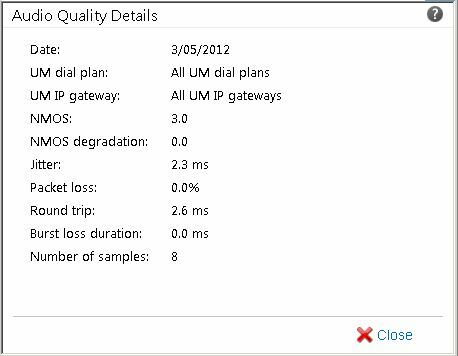 NMOS The Network Mean Opinion Score (NMOS) score for the call. The NMOS score indicates how good the audio quality was on the call as a number on a scale from 1 to 5, with 5 being excellent. Note The maximum NMOS possible for a call depends on the audio codec being used, and NMOS may not be available for very short calls that are less than 10 seconds long. NMOS degradation The amount of audio degradation of the NMOS score from the top value possible for the audio codec being used. For example, if the NMOS degradation value for a call was 1.2 and the NMOS reported for the call was 3.3, the maximum NMOS score for that particular call would be 4.5 (1.2 + 3.3).